Team building games can be fun, but are usually a waste of time. (Had to be said!) Here’s how our teams tap into their sense of purpose and passion to become high performers. The conventional, trust fall-based approach to team building is broken. And when I say “broken”, I mean “never worked in the first place”. Not only do team-building games feel contrived, they don’t translate into the work your team does or change how you work together. And games that involve revealing your innermost hopes, fears, and desires (eep!) often backfire by making people feel less comfortable. The only thing team building games do well is provide a shiny distraction from the difficult task of figuring out how to do great work together. Look: if you got here because you Googled “team building”, this probably isn’t the article you were expecting to read. But stay with me. Working well together is the ultimate goal of team building, and we believe in getting straight to it. If you lose focus on the work itself, you’ll essentially build a book club and might as well bring wine to the office. Real team building means actually trying different ways of working and iterating on them. (More on that below, including a dozen proven techniques our teams use.) Fortunately, you can go about it in ways that also move your work forward. In days past, managers might seek to get their team over the hump by keeping them busy, busy, busy. But unrelenting efficiency comes at a cost. “We sell out,” says Dr. Jason Fox, a former researcher at Murdoch University and author of How to Lead a Quest. “We stop listening, we stop empathizing.” Which, in turn, means we’re blind to the needs of our customers and each other. Now, leaders at Atlassian and other forward-looking organizations like Culture Amp and Impraise nurture morale by building trust and a sense of belonging, thanks in large part to research conducted at Google. Over a two-year period, Google studied 180 of its teams and interviewed 200+ employees. They found that above all else, team members need psychological safety. The safer we feel taking risks and being vulnerable in the presence of our teammates, the more we will admit mistakes right away, ask the “stupid” (but necessary) questions, challenge assumptions, share information, and propose ideas that are so crazy they just might work – all of which are key ingredients for creating a high-performing team. Fostering psychological safety is a full-team job, but it starts with managers. We coach our leaders at Atlassian to openly ask for help, try new approaches, and treat honest failures as opportunities to learn. They’re also free to share their hopes, fears, and struggles to whatever degree they’re comfortable, even when it has nothing to do with work. That sets the tone for the entire team. Building trust and belonging is a sound investment. Just be prepared to play the long game. For the increasingly popular cross-functional team, it’s even harder. Team membership changes depending on the project, with members filling a variety of job roles. It’s an effective organizational model (one that Atlassian uses frequently), but there’s a catch: fewer shared skills and experiences means it takes longer to build trust between teammates. Getting to know each other on a personal level takes more than a round of “two truths and a lie”. It happens gradually through casual banter at our desks, pick-up ball games at lunch, team dinners, etc. And, of course, by working together toward a common goal. Atlassian teams are big on agile principles like continuous improvement and iteration, which drives us to experiment with different ways of working together. In 2013, our teams started writing down various collaboration hacks that were working well for them so teams throughout the company could take advantage. By 2016, we were confident enough in their value to share these techniques, or “plays”, publicly. We call it the Atlassian Team Playbook – our free, no-BS guide to building healthy and high-performing teams. Download the team building infographic here and print it out for your workplace. Let’s dig into the benefits of each activity and when to use them. Click on the name of a play below for full step-by-step instructions, downloadable templates, and other resources. Rules of Engagement This is a 30-minute activity where you learn about your teammates’ preferred work styles and establish some cultural norms for the team. (E.g. “Headphones on = deep work mode, so please don’t disturb.”) Run this play after forming a new team, or any time team membership changes. It’s also useful when team members are getting on each other’s nerves so much that it’s affecting their work. Team Health Monitor Similar to the retrospectives run by agile teams everywhere, but with an emphasis on high-level concerns. Your team will self-assess in eight areas critical for high performance, like whether you have the right skills on the team, and identify ways to shore up weak spots. The assessment is based as much on gut-feel as on data, so it may require people to take a leap of faith as they share thoughts openly with their teammates. Run this play on a regular cadence, typically monthly or quarterly. Stand-ups Not just for agile teams anymore. In this 10-minute ritual, teammates share their progress since last time, their plan for today, and whether they’re blocked on anything. It’s a great way to build muscle around open communication. Don’t be surprised if you notice people offering to swing by a teammate’s desk to help them get un-stuck, too. Run this play daily. “Dicebreakers” We’ve all shown up at meetings only to find that key people are running late. This is the perfect time for a 2-minute get-to-know-you activity. Print and assemble our nifty paper dice (download ’em here), then start rolling. The questions are personal, but not too personal. Off-topic Ok, this isn’t an official play (yet). Create a group chat room specifically for sharing book/article/movie recommendations, cat gifs, recipes, etc. Set notifications as low-key as possible so the room doesn’t become a distraction. Do this at any time. Retrospectives A classic agile development ritual that is suitable for any type of team. The basic format includes a discussion of what has gone well, what hasn’t, and what to change (but there are loads of variations). It’s a safe space to dig into problems the team is facing and tease out solutions. Run this play at the end of each sprint, or on a monthly cadence. Elevator Pitch This 30-minute activity can be focused on a specific project or your team in general. Using a fill-in-the-blank template, you’ll articulate what the team delivers, why it matters, how it is unique, and who your customers are. It’s a massive (and efficient) win for building a shared understanding. Run this play at the start of a new project, or any time you need to reinforce the team’s sense of purpose. Goals, Signals, and Measures Speaking of a team’s sense of purpose… use this technique to align on your high-level objective, signals you’ll listen for that indicate you’re on the right track, and measurable results that tell you you’ve succeeded. Run this play at the start of major projects, when leadership changes, or when forming a new team. Sparring Don’t panic: sparring means “practicing”, not “fighting”. Present a work in progress to your teammates, then let them suggest ways to improve it. Be open to challenging questions and respectful dissent – that’s where the magic happens. Run this play weekly, if possible. Problem Framing Use this 30-minute activity to understand your team or project’s purpose at a deeper level. You’ll define the problem you’re solving, the impact for customers, the contexts in which it happens, and wrap that all up into a problem statement. This works especially well with cross-functional teams. The more perspectives, the better. Run this play when forming a new team or at the start of a major project. By incorporating the techniques here into your every-day work, you can build a strong team without a staging a big-budget offsite. Now, I’d be lying if I said Atlassian teams have never rocked some “telephone charades” or gone bowling together. 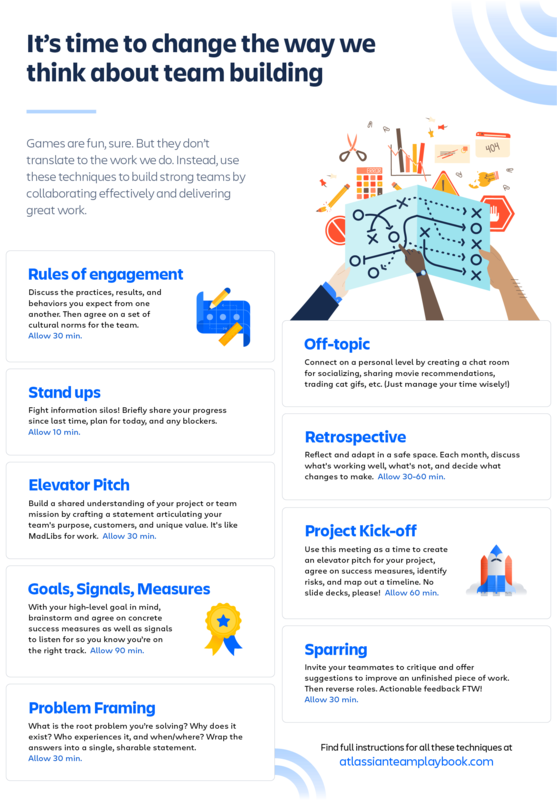 One of Atlassian’s company values is “Play, as a team”. That comma is intentional. We’ve learned the team that plays together stays together. But the fun has to feel organic in order to be valuable – not forced. Find complete instructions for the activities discussed here, plus 20+ others, in the Atlassian Team Playbook. It’s free and you don’t even need our tools to use it. What are you waiting for?